I came with a joint “idea”, which I shared with my partner Jürg, namely to “go cruising”, but had only a very vague idea what it really would mean to me. Jürg is very experienced and has sailed some 25,000 miles in his life, while I had only been on a small sailing boat on Lake Constance. 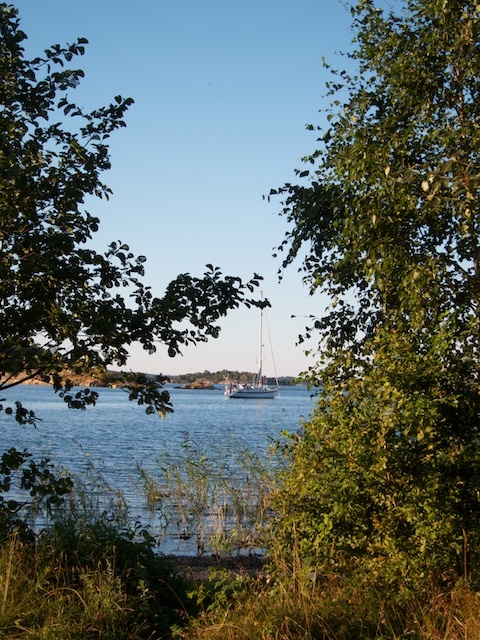 He had this “cruising dream” of his; living on a boat and go voyaging together with me, but I had no clue about it all, simply since I am no sailor and had so little experience. After the week on Regina Laska this “idea” turned into a firm dream of mine, now shared between both of us, Jürg and me. This dream has since turned into a plan! Yes,we are going to do it! You see, after having sailed with Leon, I can suddenly fully understand my partner Jürg. What I experienced onboard Regina Laska showed me the way. On Regina Laska, it all fell into place since I could experience something very “concrete”. Before my cruise with Leon, whatever Jürg was talking about, to me, it all sounded like some diffuse cloud. It was all like just air to me! But after my week onboard Regina Laska, this airy cloud received shapes, colours, smells and feelings. I not only believe to know what it means to “go cruising” nowadays, but, more importantly, that I really want to do it myself as well! 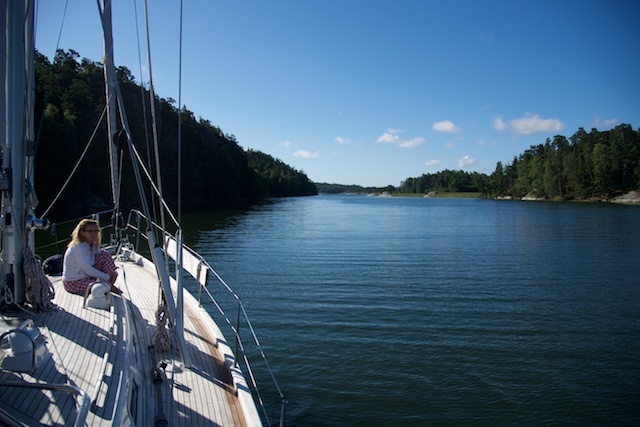 I left Regina Laska with a firm goal for my future life, which had to include a boat like a Hallberg-Rassy! Yes, I was scared before I came: Jürg is so experienced! He has sailed so much in his life and I had not. He had this fixed plan in his head, but I was so very far behind him. I knew so little and was really scared to death that I would not know what to do if something happens to him! Without Jürg I would be nothing on a boat! 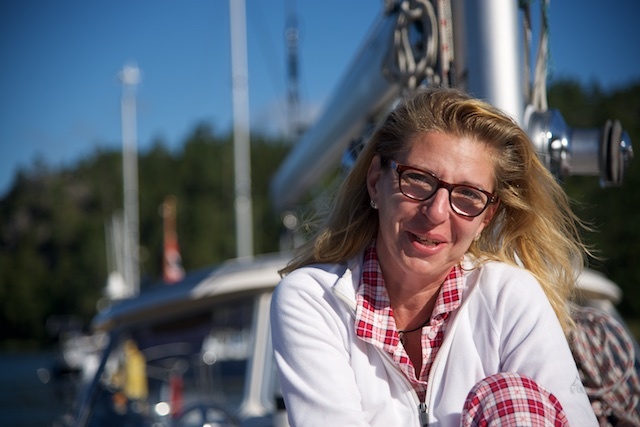 But during the sailing week onboard Regina Laska, Leon gave me so much confidence. Without fear, I now understand I can learn it all eventually. I think my biggest problem was that I had so little self-confidence. Before I didn’t even dare to take the helm since I thought I needed to be perfect before I could even try to take over. The biggest lesson Leon gave me was that YES, I can do it! I now see that I can handle most situations, as long as I give it a try. It became obvious to me that I can do much more than I thought! Before I thought: “Jürg is so good at it, why should I bother to try to be any better?”. But after my cruising week onboard Regina Laska, I suddenly have this burning desire to try it out myself and I really get a feeling of satisfaction when I see it works! After the sailing week with Leon, Jürg and I have become a real team. 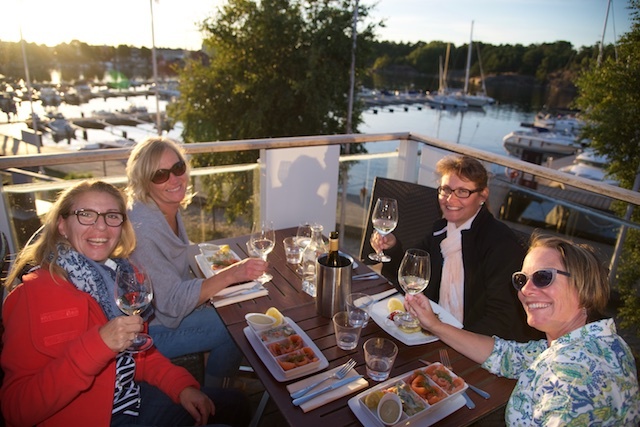 I can tell you it makes it so much more fun when we now talk about choosing the perfect cruising boat and its equipment! I have suddenly become involved, sharing his dream and also putting in my requests what I would like to have onboard as equipment that is important to me! Of course it didn’t come overnight and actually took the better part of the sailing week on Regina Laska to get this far. During the first two days I thought I am not made for this at all and should possibly better remain in my Swiss Alps instead of sailing to sea. The days before I boarded Regina Laska, I tried not to think too much about it all. I had loads to do in my work, so it was easy for me to disregard from the fact that I was becoming increasingly nervous about the sailing trip with Leon. The closer we got to the day of my flight to Stockholm, the more my thoughts began going round in circles and I couldn’t stop myself from becoming anxious. Why was I doing this? Was this “cruising idea” at all my thing? 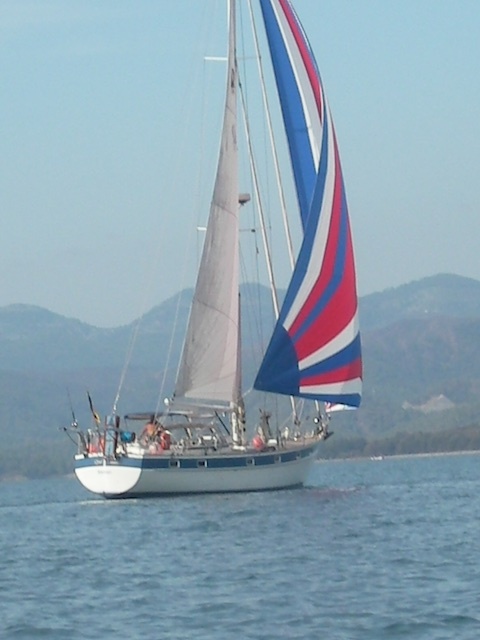 For whom did I join the sailing course; for me or just because Jürg had this crazy dream? Would I cope with living on a boat for so long? What if I hadn’t understood a thing after the week with Leon…. and what if I feel sick during the entire week? A few days before my flight, my thoughts felt like a washing machine: each turn some other piece was lying on top. This is how my thoughts were going round in circles. 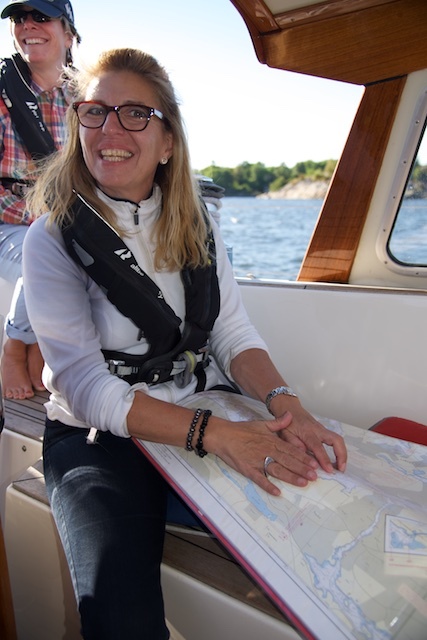 The moment I stepped onboard Regina Laska in the centre of Stockholm, all my anxiety went away thanks to the warm welcome I immediately felt by Leon and Anna, the first student who already had arrived onboard. It didn’t take long for me to feel very comfortable onboard, backed up by the homely atmosphere onboard. I moved into my cabin and stowed away all my things in the cupboards provided and noticed with surprise that everything I had brought fitted, thanks to Leon’s detailed suggested packing list and not to bring too much. 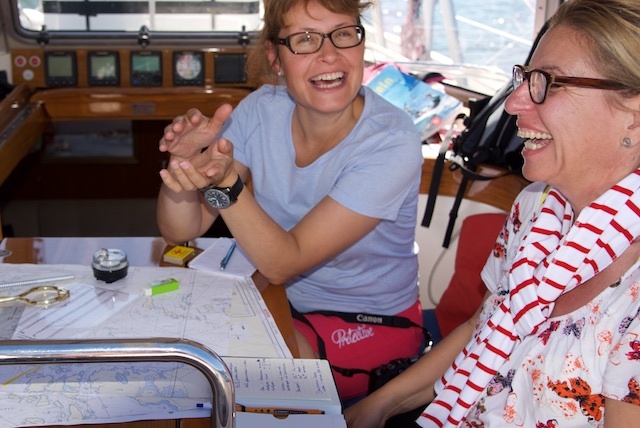 The great news Leon told was the fact that, for this week, we could stow away all our foul weather gear, thanks to the excellent weather forecast for our sail training week. 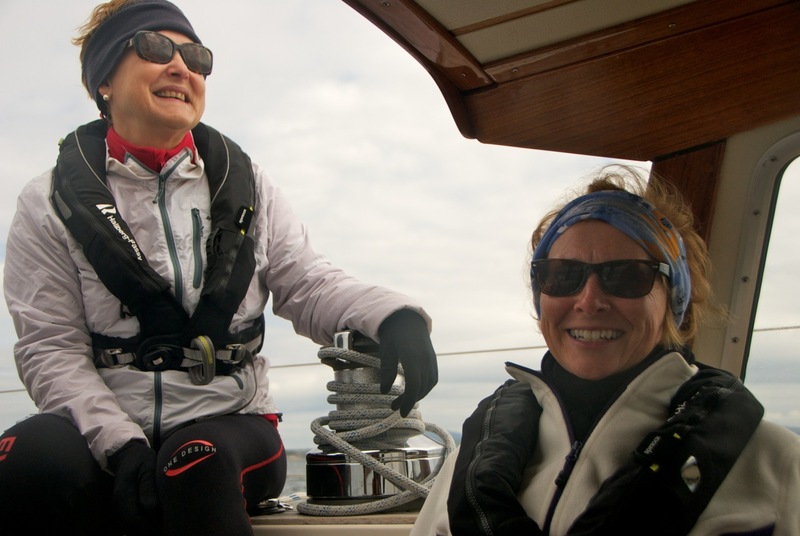 Soon thereafter the remaining two ladies had arrived and installed themselves and we all met on deck for a welcome drink and some information, followed by the detailed safety briefing. At that point in time, I thought this would become a nice cruise after all, with all the other girls doing the major sailing job while I could relax and enjoy the scenery. This thought – too good to be true – quickly vanished when Leon handed me the chart and said I should navigate us out of the city of Stockholm! What a shock! I thought I had misunderstood, since my English wasn’t that good, maybe….? How would I navigate, since I don’t know how that works! If I am honest, I can reveal I didn’t feel I could do it at all! All these islands which all looked the same in the archipelago! Where does one island end and the next one begin? There should be a green buoy somewhere, and then a red one somewhere else, a light house…. All very clearly marked on the chart, but where were they all in reality? I couldn’t get the surrounding to fit the chart. Or vice versa. The chart made my eyes go round and soon it all felt more like a riddle than pathfinder. My last courage I had gathered earlier that day now gave way to the feeling of desperation. I will never understand navigation, I thought! At the same time, Leon stayed totally calm and confident, believing in my ability, just helping here and there, when I felt I had totally screwed it all up. Somehow we got to our first anchorage that night and I couldn’t believe that I had actually found the way myself! I was totally exhausted when the anchor fell in Napoleonviken! 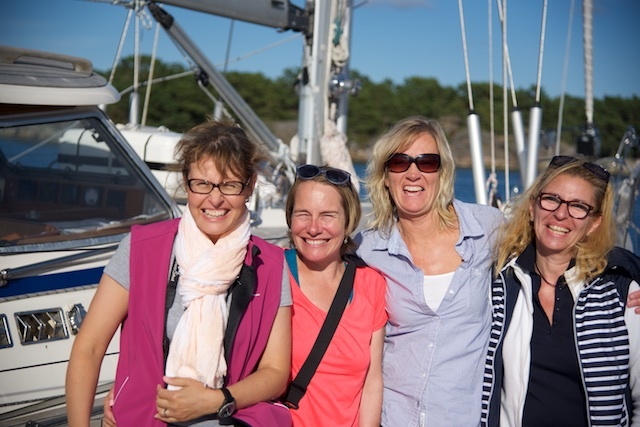 I must say the women crew onboard was great and, further to sailing, we had so much fun together, since, after all, we all felt a bit lost in the beginning when it came to sailing. I was also thinking if Jürg would ever understand me how difficult I felt it all was in the beginning, since he new sailing so well and for me everything was so new! I began to do my best to hide behind the others. I didn’t cry out for tasks onboard, if you see what I mean, and gladly let the others do it instead. When I didn’t ask for attention, maybe nobody would notice how stupid I felt during the first few sailing days? Not until at the end of each intense working day at sea, I could really relax and could then enjoy all the fun us ladies had together. Surprisingly enough, I slept wonderfully onboard in the comfortable berth, something which is really is not always the case at home… During the third night I even started to dream in English, of course about vessels “giving way” or being the “stand on vessel”. On the Thursday, I remember feeling my heartbeat went up when I was again asked to the nav-station to do the chart work of the day. But when I sat there in front of the chart that day, a miracle happened: Suddenly I could really “read” the chart, knew exactly where I was at all time, could name my position all day long, while bearings, courses, deviation and variation suddenly made sense to me! Plotter and divider became tools as natural as the pencil and the eraser and with ease I could find my way through the maze of islands that day. It felt like when suddenly a switch had been moved from “off” to “on”. Maybe I would become a sailor after all…? Maybe I would understand what this was all about – and all this in English? The pressure and uncertainty I had felt during the first days slowly vanished and gave place for a feeling of huge joy, satisfaction and even pride. 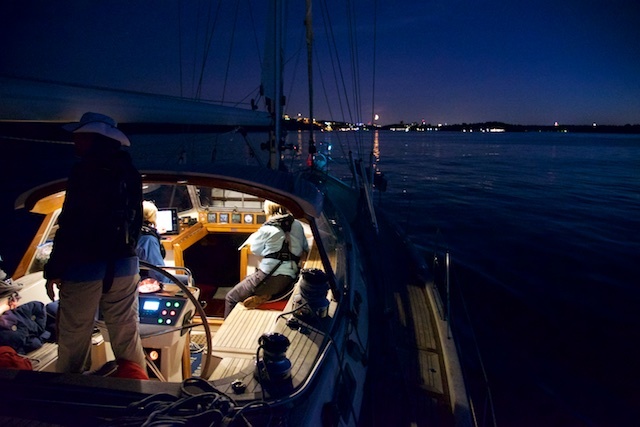 Suddenly, it seemed to be so right, that I had taken the decision to join the sail training leg onboard Regina Laska. I am so thankful to you, Leon, that you never gave up believing in me! After my week with you in Sweden, I now feel that I have the courage to do things myself! Before that was unthinkable! Leon, I am sure: If I hadn’t had that great feeling of success on that very Thursday thanks to your own never-ending patience and my own patience to wait until time was finally ripe for me, I know the “fire” in me about sailing never would have ignited. With great joy, I can today say that it is no longer just Jürg’s dream to go cruising, but mine, too! Today I have a clear picture about my dream, also thanks to all endless discussions about blue-water cruising and how it really feels to be out there we all shared during the week. It was so wonderful to hear you talk about all destinations and the life-style it actually is to become a live-aboard. And so wonderful to share my questions and thoughts with the other girls. It felt so re-assuring that we all seemed to have the same type of questions, sometimes quite different to what we usually hear our corresponding husbands talk about. After all, there are things we, as women, would like to ask, and it was great that we had this open-hearted atmosphere onboard that we could talk about everything. Without my sailing week with you, Leon, I would still not know if this would be something for me, or just the “cloud” of my dreaming husband. But to receive the answers to all m questions was just one part of the week. The other part was the wonderful time we spent together, topped up by a wonderful crew, becoming spoilt by great food and a very pleasant ambience. Great complement to you, Leon! Through you, I learnt that sailing and to enjoying life goes hand in hand! Thank you! 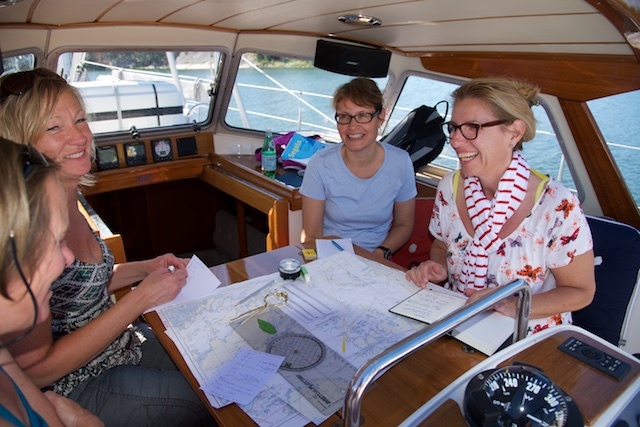 After her participation on Leg 5-2015, Kathi flew back to her husband Jürg und enthusiastically told him about what she had found out about herself and her desire to go cruising. Jürg was not disappointed about her wish to cast off from their old lives and go sailing. 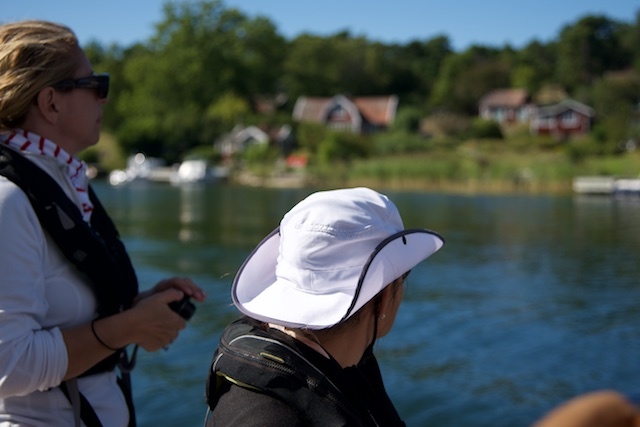 He let Kathi take a major part when jointly deciding which boat to buy. It became a 30 year old Hallberg-Rassy they found in Turkey, which was owned by a very careful and knowledgable German, who had owned her from new and who had loved his Hallberg-Rassy from the very first day he picked her up from the yard until he now sadly had to sell her due to age (his age – not the boat’s age!). 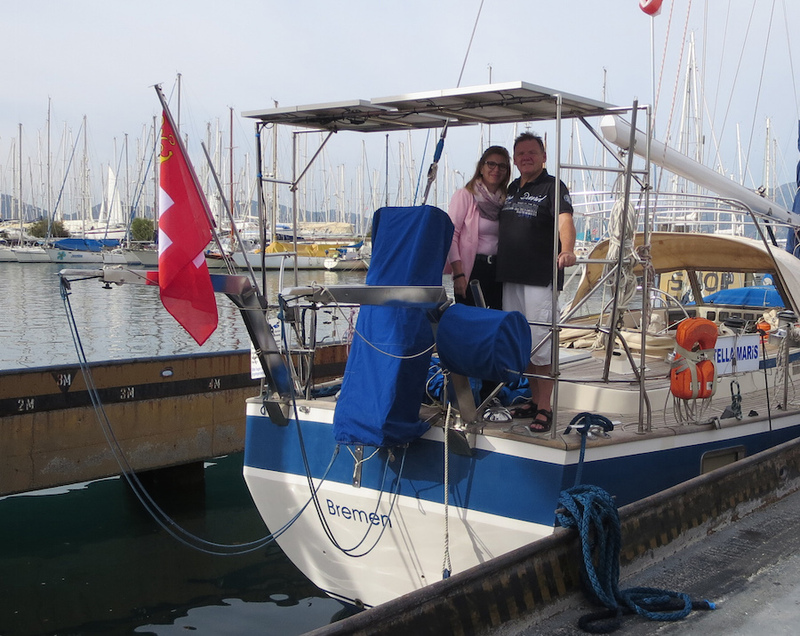 Kathi and Jürg dream about a circumnavigation after a planned refit of their newly bought Hallberg-Rassy. 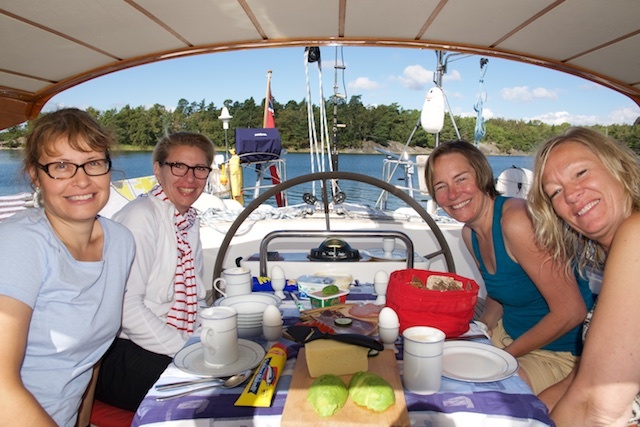 They sent the below photo to me two months after Kathi’s sail training course onboard Regina Laska, turning them into the third couple who bought a Hallberg-Rassy after having sailed on Regina Laska in 2015.